Swimming club upset with City's plan for yacht tournament plan a protest. 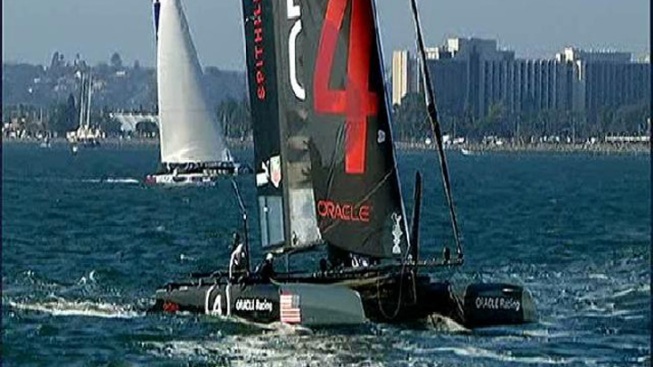 A group plans to protest the America's Cup race if some changes are not made. The spirit of the Occupy Wall Street movement is spilling into the San Francisco Bay -- literally. A group of 1,200 swimmers who belong to the Dolphin Swimming and Boating Club are planning to Occupy the Bay during the America's Cup if the City does not make some changes to the event, according to a story in The Bay Citizen. The digital newspaper reports that the group's central complaint revolves around a plan to block them from the cove they usually swim at, located past Fisherman's Wharf and near Aquatic Park, and limit them to swimming only the perimeter during the race. "Our real power here is to misbehave, to act up, to occupy," Hal Offen, a club member and organizer of the protest, told the paper. "This is a rich person’s sport." He equated his group's struggle to those on Wall Street protesting against the extravagance of the 1 percent. The group is also concerned with the environmental impacts the race will have on the cove and the bay at large. The City's plan includes a 44-foot by 22-foot jumbotron to be installed on a 140-foot barge for viewers to be able to see the races from the shore. Members of the group say if the City does not change their plan and include them and other citizens in the planning they will swim out to the center of the cove, where some yachts will be, to disrupt the race. "Unless they have Navy Seals to arrest us, we’re going to keep swimming," club member Andrew O’Mahony told the paper. The City says it hopes to work with the group to find a resolution. To read the full story, visit The Bay Citizen's website.